For position I place both bells parallel to each other between the feet. Now stoop down and raise same up so that the discs or globes rest on the thighs, the bells being held together. 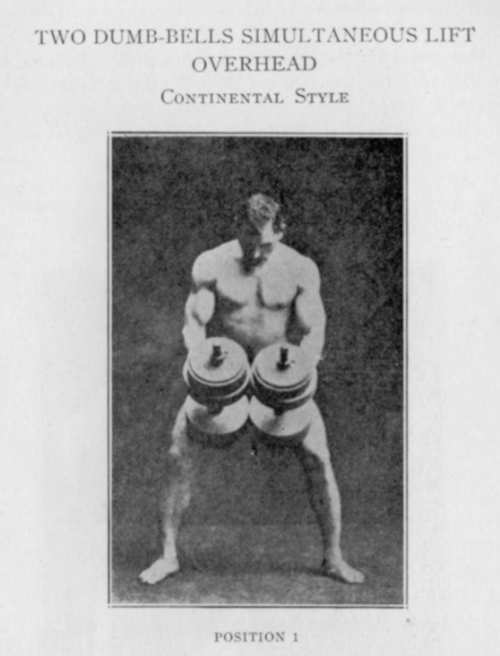 By leaning backwards you will be able to pull the bells on to the body, from whence by a jerk you get them partly on the chest, and so to the shoulders, after which you stand in a firm position ready to sink below the weights and to move your feet to enable you to dip beneath your dumb-bells as they go aloft. This is done by a vicious jerk, after which you sink and so get the bells overhead, the eyes to be on them as they go aloft for fear you lose the balance. If you would lift them in the clean English style, then they may be taken from between the feet, or from the sides of the feet, you to lean backwards as you pull them up and split the feet in two opposite directions, one to the back, and one to the front. Still another way is to stand with them at the sides, and whilst in this position give them a swing to the front and then to the back and so up to the shoulders. Take advantage of this swing, and by a movement similar to the one last described regarding the feet, you will find the bells at the shoulder. The latter position is more suitable to tall men than to short men.